I want to show you a tree. 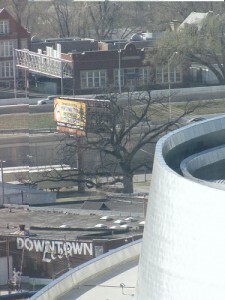 An historic tree that I can see right from my office. What I have to say about it is a little graphic. So if you are little delicate you may not want to read any further. Do you see it? Tucked in there on the other side of the BOK Center, where the NCAA tournament was playing this weekend, next to the Inner Dispersal Loop. It is not in a good neighborhood. Lots of abandoned buildings, the county jail and the Day Center for the Homeless are right down the road. Lets go get a closer look. The tree has always looked alive to me in a scary kind of way. This tree is known locally as the Creek Hanging Tree. According to the book, “Tulsa’s Haunted Memories” by Teri French, between 15 and 20 people were executed by hanging from the tree between 1870 and 1889. One time three cattle rustlers were hung at the same time. I read somewhere else, but cannot find the reference, that the tree is right next to the original railroad and a passenger train pulled through right after the execution and the sight of three men hanging there made quite an impression on the train passengers. I don’t know if that is true but it makes a good story. 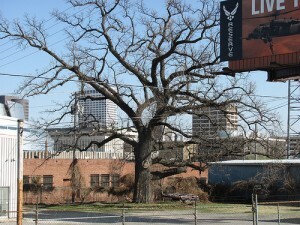 Tulsa portrays itself as a very sophisticated city. It is, we have the Philbrook and Gilcrease museums, Opera and Ballet companies. It is also home to the Tulsa Race Riot which some call the worst ever in the United States. Machine Gun Kelly and Pretty Boy Floyd spent some time in the area. Tulsa has rough side in its history that I find fascinating. 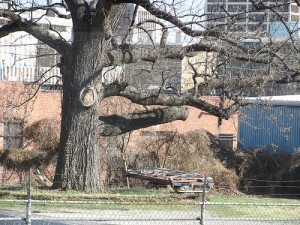 The hanging tree is one of the remnants. This entry was posted in My World, Tulsa History on March 21, 2011 by Alan Bates. Fascinating history. It’s interesting to learn both the “good” and “bad” history of an area. I’ve always heard about the Hanging Tree but never knew exactly where it was located. It is a Magnificent old tree. Nice that it has a recorded history. Any idea what kind of tree? @Gaelyn – Apparently it is a Burr Oak. The tree is eerily beautiful. Oh my those Oklahoma hangings. We do have to take the good with the bad. It is our history, but I think it is the same in every state. In my area we have the hanging bridge, a tragic part of our Oklahoma history. What a fascinating post for the day!! And such a beautiful and historical tree! I would love to see a picture of it when it is leafed out, but bare, it is the perfect “hanging tree”. Great history! And this definitely gets my day off to a super start! Have a wonderful day! Spooky. But I love that a piece of history still stands. You are my favorite history teacher. What a beautiful old tree and the history is fascinating! It looks kind of spooky without its leaves. Hmm, kind of creepy, but interesting. Thank you Prof. Yogi! Fascinating history on the old tree, and kind of horrible to imagine 3 bodies hanging from it. You usually show the cultural side of Tulsa, Yogi, but this rough and tumblel part is interesting, too. What a great story, Yogi (of course I wasn’t repulsed…)! 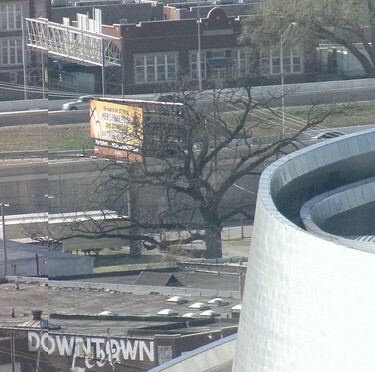 Makes sense that the tree is close to the jail. Perhaps “in the day” it served as a kind of deterrent to crime. What about that big branch at the bottom that seems lopped off? Great story!! Boom & Gary of the Vermilon River, Canada. Most trees lead such boring lives. It may be a nice thing that no-one is around still who remembers the gruesomeness. The tree stands there mutely, what a story. That’s pretty creepy! Thanks for visiting my Cottage Country! That bare branches hanging tree looks great. Thanks for the glimpse of the history of the tree. What a story! I think it’s good the tree is still there, it’s a reminder that society changes and sometimes for the best. French had the death penalty by the guillotine until 1981… can you believe it? Now, it looks like it could occupy the front yard of the Addams Family homestead. What a gruesome history… but an amazing-looking tree. How can I have wandered over every square inch of downtown Tulsa and never seen this? Maybe I saw it but didn’t appreciate its history. You have skunked me again you rascal. Very cool. The tree has an ominous look about it, like a Whomping Willow! With such an interesting history, I hope they let it be. fascinating! the tree looks creepy at the same time, majestic. It’s incredible that it still stands. 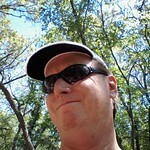 following you, hope you’ll follow me back..
Has the tree been kept up for sentimental reasons? It would be great to get the tree’s version of events over those years. How does a tree shake off being so ill-used? Thanks for the story. I enjoyed this post. Great post and interesting story about the big old tree. Thanks for sharing.